Thanks to all those who attended the AGM on the 11th and for the apologies. We’ve got a good executive committee with a few new faces – Katie Moore as secretary and myself as president with Bruce Halket taking on the vice president’s role, Tim Ross as treasurer, and Di Condie returning to the road handicapper position. As noted at the AGM, a big thanks to the previous exec and the subcommittees , in particular Bruce, who have enthusiastically steered the club into a healthy position. It’s my hope that the club will continue to be the vehicle for fun, social, grass roots, cycling events. In the next few weeks the subcommittees will be constructing the spring event calendar and we’d welcome any feedback on the proposed events and any thoughts on what the club could be doing. There is a message section below or you can email me at mansfield@guardianpharm.net or phone 0428 50 34 37. Please also check that you are signed up for the updates feed (on the right of the page) if you want to keep up with late changes/messages etc. I’ve attached the minutes (Click Here) as well from the AGM for your reference. MMBCC is working with ABC Open to produce a series of short films about people in our club. The films will be produced by local community members under the skilled guidance of ABC Open Regional Producer Benj Binks. Once complete the stories will appear on the ABC Open website and there's even a chance they'll screen on ABC TV... A great way to highlight what a fun, social and diverse club we are! Other ABC Open projects will include regular race blogs posted by club members and photos that capture 'What I love about my sport'. The project is a great chance to improve your movie-making and photography skills with the help of a professional (for free!). A full day of interviewing and filming is then planned for Saturday September 3rd. To get in on the action simply call Uschi Steedman on 0427 849 777 or email uschi@positivemoves.com.au . If you know of other people who are NOT club members but you think they'd be interested - then please feel free to invite them to get involved. Anyone in the community is welcome to participate in creating the stories. Mansfield Mt Buller Cycling Club Inc.
Due to today's inclement weather, the race has been called off and a new date will be announced very soon! The club's AGM will be held at The Produce Store on Thursday 11 August. 6pm for nibbles and the M2M presentation, followed by dinner and the AGM. Is there anything you'd like placed on the agenda to be discussed? Let me know - bruce@bikevents.com.au - before Tuesday the 9th please. Want to learn how to make films? Benj Binks, the local Producer from ABC Open is about to start a project titled On the Ball which looks at Australia's obsession with sport. He is keen to work with sporting communities in Mansfield and give them the skills to create videos, write blogs, and take photos. Participants will learn from Benj in a series of workshops the skills of recording, editing and sharing stories. The theme for the videos is 'local legends', and there are also ways to get involved through photography. We are also looking for people to write blogs about riding in the region. The first workshop is happening at MACE on Wednesday August 10 from 6-8pm. Please bring along any relevant equipment you have as well as ideas of local legends in the Mansfield bike riding community or footy community who you think would make a good story. Don't forget to get your entry into Di via SMS on 0438 513 355 by 8pm this Friday. In case you didn't get there, Darren Bakker got up again for his second win of the series! On a windy day which was likely to favour Scratch, Bakks and Tim Ross rode really well to take a comfortable win. There's a rumour going around that Tim put in an awfully big effort to help Darren; he tried so hard that there was a little bit of a spew afterwards. Either that or it was some sort of strange celebration gift for Darren! A Wangaratta rider, Alex Meyland, is shortly going overseas to compete in the World MTB Championships. The WCC committee want to assist Alex with the cost of his travel and have decided to donate the first race of the Spring Series to him, this will mean that all income from entries on the day will be passed to Alex with no prize money paid. The Wang Cycling Club hope that you will support this and wish Alex the very best in his competition and the committee hope to see as many people there as possible either racing or supporting the racing. With many thanks to Fiona Greenway, here are some results from last Tuesday. Racers who finished 1st, 2nd or 3rd qualify to ride in the Crits on Sunday 16th October before the Herald Sun Jayco Tour. So we'll see Lachy, Kirra and Mitch in Melbourne in October! Congratulations! 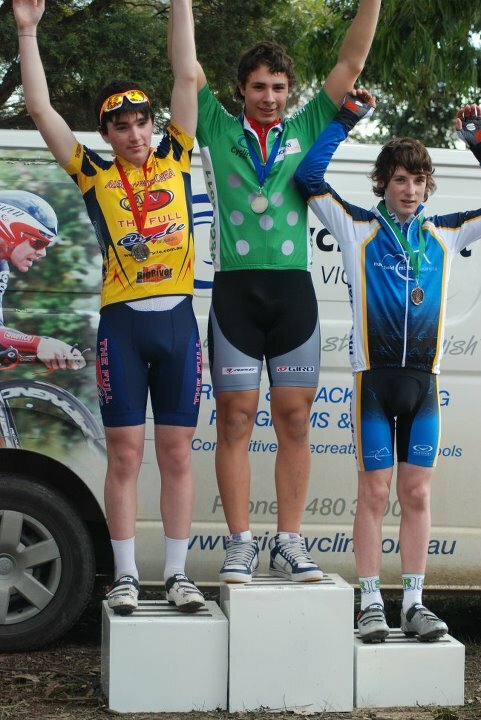 Good luck to Mitch who is also racing in the VSCC state mountain bike finals on Sunday 28 August! It is so exciting to see the new and repaired bridges being worked on along the trail. The bridges through the Yea flood plain and over the Yea River are near completion and look great. This will be a fantastic ride with over 320 metres of rebuilt bridges. Some people have been wondering if the trail is heading to Yarra Glen from Yea,down the Melba Highway, no it isn’t. The trail follows the original train line which veers left across the Yea River then on to Cheviot Tunnel and Molesworth. Once the Yea River bridge is finished the construction crew will move onto the Goulburn River bridge then through the flood plain towards Cathkin. Pavement construction is going well, despite the wet weather, with chert now laid past Cathkin to Eglington Cutting and Yarck. The sub base is in place from Tallarook to Homewood and Eglington to Alexandra but is not yet ready for use as granitic sand is to be placed on top, this will form the final surface. Although it is tempting to have a ride or walk on the trail it is very much a construction site. It is impossible to isolate the areas that are under construction therefore we would ask everyone to refrain from entering the trail area. The Tallarook plateau and Strathbogie plateau are the birthplace of the sport of rogaining or 24 hour cross country navigation. With the generous co-operation of many land owners the sport was developed in the 1970s. The sport spread around Australia in the 1980s and is now active in 30 different countries. Neil Phillips and Christine Arnold organized the first rogaining championships in May 1979, centered around the town of Tallarook. As I type this, Simon has taken the leaders yellow jersey in Denmark! That's all for now … see you out there.